A disused church in Rotherham has undergone a full conversion to create much-needed high-quality business space, ideal for enterprises taking the next step. The former Wesleyan Reform Church on Coronation Road in Wath was sold by trustees and has recently opened as Dearne Valley Business Centre under the brand of "My Head Office." Ten office "pods" ranging in size have been created in the 7,000 sq ft building, which has undergone a redesign and restoration to offer unique space complete with high ceilings, parquet floors and large windows. Suitable for one, two or three people, the units are aimed at growing small businesses from the local area that are taking the next step, moving out of the home office or up the premises ladder. Property investor, Stephen Hollings was supported in buying the property by Smiths Chartered Surveyors in Barnsley. It was advertised as a residential development plot. "Everyone else who looked at it wanted to flatten in," said Hollings (pictured, left), proudly showing off the conversion work that has taken place. "But we saw the appeal of creating a business centre which is close to the community. "The building is fresh and unusual and now we are focusing on creating an ethos. Our motto is for it to be a place where businesses thrive. We want tenants to buzz of each other." The centre is certainly unusual, with original features retained alongside a very modern solution for the new occupants. 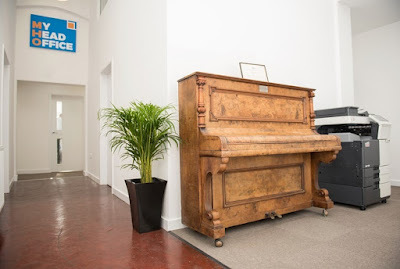 The church piano remains in the foyer alongside the hi-tech printer. 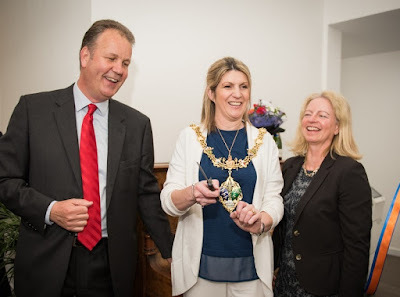 Much of the work on the building has been done using suppliers from the local area who also attended the recent launch event where the outgoing mayor of Rotherham, Lindsay Pitchley, cut the ribbon in one of her final engagements in the role. The centre is working with Barnsley and Rotherham Chamber of Commerce, RIDO, the regeneration arm of Rotherham Council and the Federation of Small Business to further develop linkages and networks. One way of helping businesses with their next steps is that there are no additional costs that often come with renting premises. Utility charges and service charges are included with rents that start from £100 a week. It is not just the tenants that are looking to grow, but the developers too. Hollings added: "This is the pilot, we are aiming for ten more centres."